Trades are not settled by delivery. What was bought must be sold and vice versa. And only the net difference in value is paid and received. CFD trades are leveraged like FX and you can make investments many times the margin. You can utilize leverage and make large trades with small capital. CFD trades are OTC trades where the transactions are made one on one between the seller and the buyer. Customers can trade by the prices we offer by signing a contract with us. ※ The prices we offer are based on the underlying asset prices and the prices offered by the covering financial institutions. There are cases where the prices deviate from the underlying asset prices due to the fall in liquidity. Leverage means moving large capital with small capital. Therefore there is a chance to make large profit with little capital. On the other hand, you must be careful as you may incur large loss if the market moves against you. 2. You can trade from either buy or sell side. CFD trades can be started from sell side or buy side like FX trades. In the case of sell trade, the more price falls, the more profit you make. Therefore, if you think the commodity you are trading is going to fall in prices, you start the trade on the sell side. There are opportunities make profits not only in the rising markets of stock indices and commodities, but also in the falling markets. For spot CFD trades such as gold and silver, payment and receipt of daily interest occur based on the official interest rate of each country. For example, you can receive daily interest if you hold a short position in a spot gold trade. On the contrary, you will have to pay daily interest if you hold a long position. 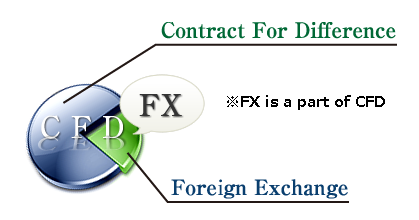 And spot CFD trades have no contract month and trades are rolled over just like FX trades. On the other hand, payment and receipt of daily interest do not occur for monthly contract CFD trades where underlying assets are listed on the overseas securities exchange or futures listed on the overseas commodities exchange. Normally the trading unit in exchange trades are too large for ordinary individual investors and investors with little experience. In CFD trades, you can trade smaller units than exchange trades. Therefore individual investors can trade with less risk until they acquire experience. At the same time, it is possible to trade in accordance with financial conditions, investment experience and trading objective. What are the overseas commodities markets? Overseas commodities market is a market where agricultural products and industrial products such as precious metals are being traded. Price movements in the overseas commodities market such as recent rise in oil prices are affecting the domestic commodities market and our daily lives. The news regarding the overseas commodities market have begun receiving attention just like the news regarding foreign exchange market. Exchanges like New York Mercantile Exchange, Chicago Board of Trade, London Metal Exchange and Chicago Mercantile Exchange are the most famous overseas commodity exchanges. In Japan, there are exchanges like Tokyo Commodity Exchange for Industry and Tokyo Grain Exchange. What are the overseas securities markets? Overseas stock markets are the exchanges where the average stock price indices for the major companies and individual stocks of listed companies are being traded. All eyes of the world are focused on these markets as they make large impacts on foreign exchange and commodities markets like they did when World Trade Center Terrorism in 2001 and Leman Shock in 2008 occurred. The main overseas stock markets are New York Stock Market, London Stock Market and Hong Kong Stock Market. In Japan there is the Tokyo Stock Market.